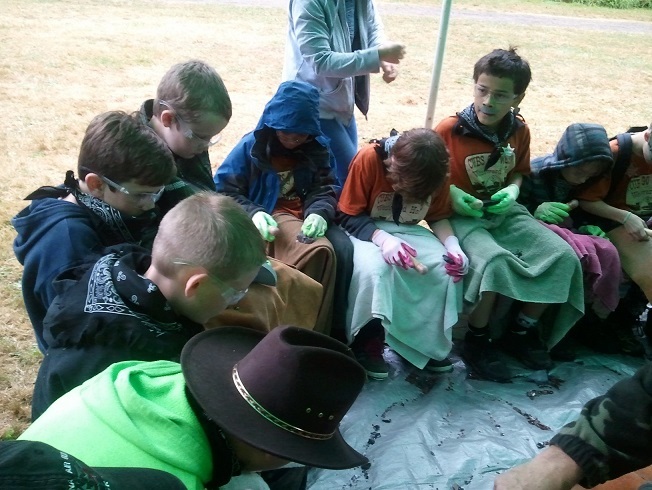 The Puget Sound Knappers were invited to demonstrate and provide hands-on instruction to the WEBELOS of the Alpine District, Chief Seattle Council August 1st and 2nd, 2013. 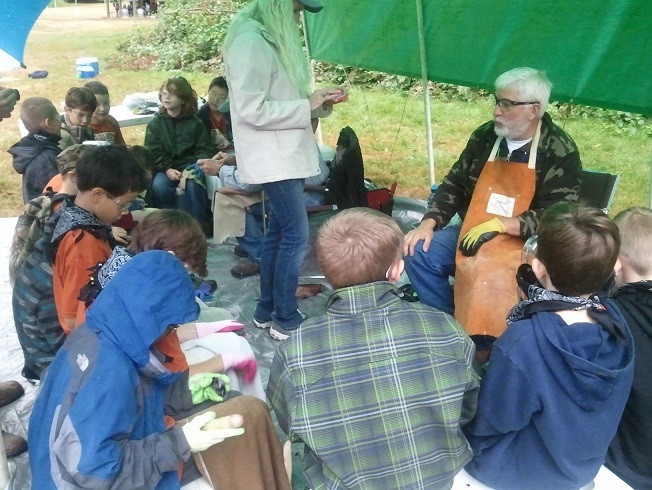 This Day Camp/Jamboree took place at the Hans Jensen Park in Issaquah, WA just across from Lake Sammamish and only 8 miles from the home of PSK Webmaster Jim Keffer's home. 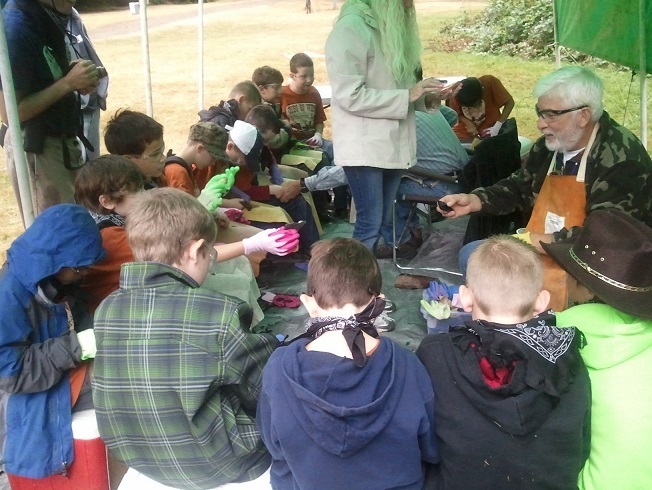 On Thursday, PSK members Donn Paris, Joe Higgins and Jim Keffer met at Jim's house and loaded his truck with all the stuff necessary to demonstrate flintknapping to more than 70 Cub Scouts. 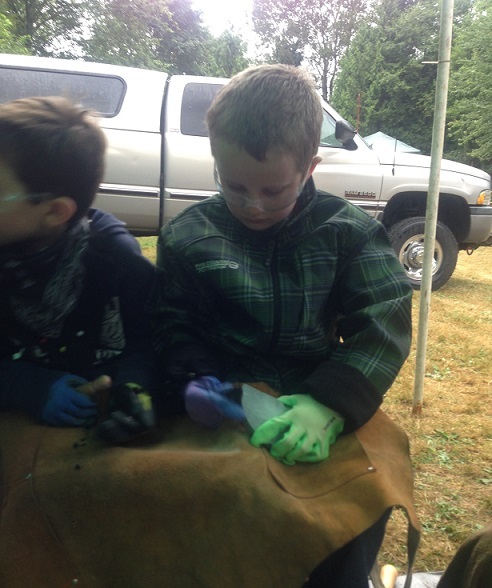 In addition to our personal knapping kits, this included safety glasses and nitrile-coated gloves for 35, loaner tools for 20 (including lap pads and abrading stones), and rock enough for 100 knappers. We also brought along a large tarp (15' x 20') a 6' folding table for a half dozen point display cases (and the display cases), and a first aid kit. Don, Joe and Jim arrived at 10:30 am Thursday morning and after a half hour setting up the knapping space - tarp, safety gear, and displays, we were off and running - at least it seemed like it! Wave after ware of scouts, a den at a time, cam for an hour long demonstration. While Joe Higgins demonstrated pressure flaking, Donn and Jim demonstrated percussion flaking. The demos were clearly a hit - the scouts paid intense attentions to the knappers and asked a LOT of good questions. We finished the first day at around 5:30pm and were loaded up by 6:00pm. Friday was a repeat of Thursday with two major expections - Donn couldn't make it back on Friday so the job of providing hands-on instruction fell to Joe and Jim. And since the scouts would be trying their hands at knapping we limited the groups to 16 - 18 at a time. We divided the scouts further into groups of 8 or 9 and Joe taught the basics of pressure flaking while Jim taught the basics of percussion flaking. We all knew up front that we wouldn't be able to teach the cub scouts to complete an arrowhead in the 30-45 minutes we were allotted so we decided to teach the how to take good flakes from spalls. It is amazing how many spalls a scout can use up in just 30 minutes! At the end of the day both Joe and Jim were exhausted - but very pleased and satisfied with our efforts! The scouts and their leaders were very appreciative and said the flintknapping was the best skill/craft courses of the week. And of course we left behind some points - not nearly enough for everyone but enough for the den leaders. Donn, Joe and Jim never had a chance to take any photos but we were able to get some of the parents to send us a few. And yes, the scouts are dressed warm with some raingear. Even though it was the first week in August it was raining and cool - but we're used to it!